Learn how to schedule Chorus all 4 years while pursuing the diploma of your choice. Earn a full I.B. diploma and take choir every year! Grades 9, 10, 11, 12 No pre-requisite. Students will participate in a chorus of tenor/bass voices. 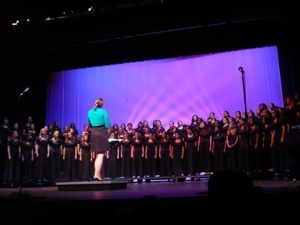 Emphasis is placed upon correct vocal performance techniques and sight-singing through the study of appropriate choral literature. Students must meet both the school day and after school participation requirements to receive credit for the course. Fees vary depending on uniform needs and performance commitments. Students will participate in a chorus of treble voices. 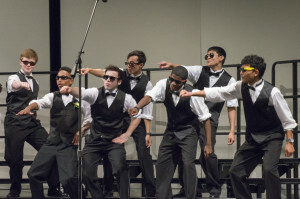 Emphasis is placed upon correct vocal performance techniques and sight-singing through the study of appropriate choral literature. Students must meet both the school day and after school participation requirements to receive credit for the course. Fees vary depending on uniform needs and performance commitments. Grades 10, 11, 12 Successful audition required. 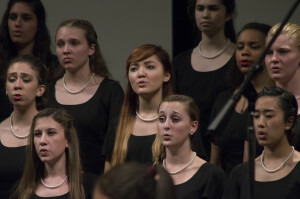 Students are offered advanced choral experiences for treble voices. Emphasis is placed on the development of musicianship and proficiency in ensemble performance. Course content includes a study of choral literature, vocal techniques, sight singing. Based on successful completion of sequential concepts for each level, students will continue as specified in course level. Students must meet both the school day and after school participation requirements to receive credit for the course. Fees vary depending on uniform needs and performance commitments. Grades 9 – 12 Successful audition required. 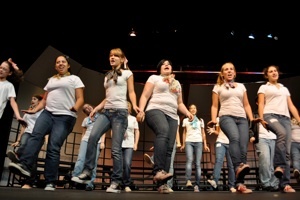 Students are offered advanced choral experiences for trebles voices. Emphasis is placed on the development of musicianship and proficiency in ensemble performance. Course content includes a study of choral literature, vocal techniques, sight singing. Based on successful completion of sequential concepts for each level, students will continue as specified in course level. Students must meet both the school day and after school participation requirements to receive credit for the course. Fees vary depending on uniform needs and performance commitments. Grades 10, 11 & 12. Successful audition required. Students are offered advanced choral experiences for mixed voices. Emphasis is placed on the development of musicianship and proficiency in ensemble performance. Course content includes a study of choral literature, vocal techniques and sight singing. Based on successful completion of sequential concepts for each level, students will continue as specified in course level. Students must meet both the school day and after school participation requirements to receive credit for the course. Fees vary depending on uniform needs and performance commitments. If you love contemporary a cappella, this group is for you! These groups are extra-curricular and meet after school 1-2 times per week. Compete yearly in a capella music festivals, international a cappella music festival, hosted by the South Lakes Choral Department. These groups are student run. Participation is voluntary. It is highly encouraged that you take part in a choir ensemble that meets during the school day in conjunction with this group.